Pond Lights NEW UPGRADED Remote Control Submersible Lamp IP68 Totally Full Waterproof Underwater Aquarium Spotlight 36-LED Multi-color Decoration Landscape Lamp for Swimming Pool Fish (Set of 2) | Fountain City Art Ctr. *Good News!!!! 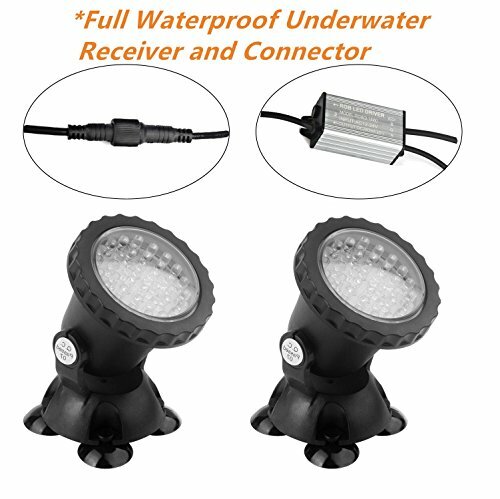 !We've upgraded our pond lights according to customer's feedback.Now not only the aquarium light.but also the Connector and Receiving Sensor are Full Waterproofing.Only our Brand New Upgraded light can support from connect to Receiving Sensor to light can 100% Full Waterproofing in this market. *This aquarium light can be used in water and controlled by remote controller. Just fix it by the sucker cup and plug the adapter into wall socket and it will give different light in different modes. Decorate your fish tank by this light, you will get not only convenience but also visual enjoyment. Each light comes with 36 LED bulbs. 180 degree adjustable direction. Remote controlling 15 kinds of static effects and 4 kinds of dynamic effects. The brightness of static effects and the speed of dynamic effects are adjustable. *(2018 Upgraded-Unique Design):We've upgraded our pond lights according to customer's feedback.Now not only the aquarium light.but also the Connector and Receiving Sensor are Full Waterproofing.Only our Brand New Upgraded light can support from connect to Receiving Sensor to light can 100% Full Waterproofing in this market. *Submersible Lamp built in 36 LED color changing, enlivens the garden pond to get ideal atmosphere and beauty.IP68, America's highest level of waterproof rating standards, which make this aquarium lights got high quality guarantee. *RGB multi-color, controlled by remote controller;15 kinds of static effects and 4 kinds of dynamic effects.Designed with 4 suckers on the base and with 180 degree rotatable , easy to mount and fix to the smooth surface. *ABS engineering plastics adopted in this light ensures safely submerging and lighting in the water, durable, environmentally friendly. If you have any questions about this product by COVO ART, contact us by completing and submitting the form below. If you are looking for a specif part number, please include it with your message.